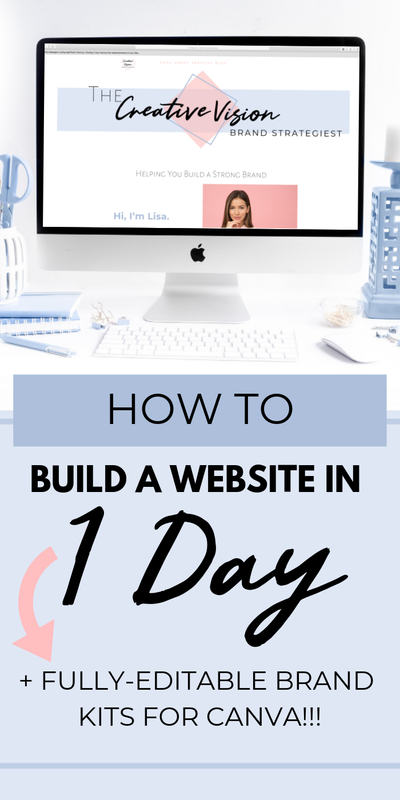 How to Create a Website in One Day! When I first started blogging, creating a website was foreign knowledge. I had no idea where to start and blogspot was the easiest for me to comprehend. At the time I had no knowledge of Wordpress. This was all back in 2012! From Squarespace, Wordpress, Weebly, Show it, Wix, and probably a whole lot more I'm not mentioning, we have multiple ways to create a website now days. With easy to use gorgeous templates to boot and drag and drop capabilities for less frustrations. So there is know doubt technology is a God-send for online business owners. You can have a website up within hours without even having a single idea on how to code. So when I came across an article about creating a website in one day...I decided to take on that challenge! I of all people know the many setbacks of having to deal with creating and building a website. When it comes to creating this challenge for myself I knew that I had to plan accordingly. Chances are if you are thinking about creating a website within 24 hours you will need a little prep work to begin! Here's 5 Things you need to do before you create your website! Tip 1: What's your website's purpose? You need to have purpose when preparing to create a website. So ask yourself what is your main reason for creating this website. Is it to collect leads, drive traffic, book clients, promote digital products. What's your #1 Goal for building this website. Then write it down!!! Tip 2: Define your Target Audience? Add in keywords for search-ability on search engine. Think about where you want your audience to go to next once they get on your website. There should be a Call to Action Button on each and everyone of your pages, even your 404 page! Ask yourself what do I want my audience to do when they leave this page. Don't just leave them hanging. When a person enters your site have a Call To Action at the top either a fixed bar above your navigation or as your header. Add a call to action in blog posts and on your side bar. Add them to your service, start here and about me pages too. So take a moment a get your pen and paper and write down next to your pages what you CTA you want them to do when they are about to leave your page. Tip 5: Lastly you need to Create your Brand Identity. So at this moment you haven't created your website. You haven't even bought a theme or selected a template. That's because I want you to make sure you are fully ready to make this website! So before you can even hop into your website theme or purchase one, I want you to create your brand identity. If you need help with that head on over to this article about How to Create a Brand Identity. The first thing a person sees when they enter a website is the visuals. Your copy won't mean nothing if no one can stand looking at your site! Going blindly into creating a website will leave you frustrated and you will quit! Let me help you out if you are tired of procrastinating creating a brand. Newest BRAND KITS are In the shop to help you get off the ground! So let's get into how to make a website in less than 24 hours! There are so many website building sites out their from Wix, Blogspot, Wordpress, Show it, Squarespace, Shopify, etc. These sites take the guess work out of building a website from scratch! Some have templates you can use and others have drag and drop features too! Look through their features and figure out which one works best for you! What are you trying to sell, start there! I use Blogspot for this blog however for my membership and shop I use Squarespace! Although blogspot is a great free tool it's quite limiting and I usually have to work around it with coding so alway look at the features and decide on what works best for you and your brand. Try out the free trials with no strings attached and see which one works for your technical skills and priorties. Action: Make sure you know what your priorities are and then choose a website builder that caters to it! Once you've settled on your website builder it's time to choose the correct plan for you. Plans make it easier for you to get features that you actually need. Action: Choose the plan that fits your need. If in doubt start small and scale up! A domain is the part of the url that identifies a web page. Make sure this domain name is what you want! Keep it relevant to your brand's content, make it simple and easy to read. For goodness sake make sure that it isn't taken by someone else! I used GoDaddy to make sure my domain wasn't taken and even decided to registrar several different domains so no one else would take it! The good thing about buying a domain name is that you can take it any where if you decide that website platform isn't what you want! Action: Make sure your domain name isn't take by anyone else and then buy it! Now it's time start creating your website! The great thing about website builders like Squarespace is that they provide templates to help you get started! Templates provide a framework for your website. Many have templates for specific needs making it even easier to find one that fits your goals and priorities! If you don't like one template simply change it! As your site grows and more people are finding interest in you, you can always buy a template off of Creative Market! There are so many amazing creators out there! Action: Choose a template from your website builder that fits your needs the best! My favorite part, if you haven't already guessed from my blog and website! Since you have your brand identity you can then go in and use your color palette, fonts, buttons, and images to form an amazing website! Add new pages to your navigation. This is something that you should already have from Tip 2 above! Changing the size, colors, and fonts of buttons. Have your brand Identity guide near by and copy and paste your colors. Focus on your fonts and keep too it. Adding new elements like contact forms to service or about page. If you have custom buttons add those into your side bar! Add an about me image to your blog side bar with a link to your About Page. AFind little ways to add a different touch to your web page by making it unique! Editing the images on your homepage gallery. If you do not have photography skills get styled stock images that speak to you. Add in a picture of yourself as well so people know who's running this amazing website! Linking/embedding social media channels. A cool way to add personality is by adding in social media icons that you custom made to your side bar. Have your social media links somewhere people can see it. You don't want them searching all over the place to find your social media links! Action: Get your brand identity guide out and start customizing! Need help with customizing your website, get your hand on the brand kits that is basically your website in a box! Step 5. Preview and test your website. With each change make sure to test and run it on different devices to make sure each page works and runs smoothly. Here are some things to keep in mind when testing your website. Are your buttons sending to the right page? Does the site go along with your brands purpose and goals? Does it function properly on desktop and mobile devices? Action: Take a moment and make sure your website runs smoothly. Read through your copy, click on each link, test on different browsers and devices! Then get someone to look at it too and then get ANOTHER person to check it out! Get multiple people to look at your website because while you know how your website works others may not. It's good to get several onlookers to see any mistakes you may have missed. Now its the end of the day! You got your template customized and looked at by several family and friends and now its time to hit that publish button! Shout your website out to the world! Tell your family and friends! Share it to your social media platforms! Of course you may want to go back and customize more but the thing is you got it out! You stopped procrastinating and you just did it! I'm so proud of you! If you are bit unsure if you have the creativity to do it, I'm here to tell you, you have everything inside to create a brand you love! If you need that extra kick in the pants get one of the brand kits I keep mentioning! These are fully customized elements that you can customize in canvas In literally minutes! You can use the templates provided to add in your fonts and colors with ease! Anyone can make a website all you need to do is just...START!